1. Evan, be gentle with Megan. 2. How do we ask for something? 4. *Sigh* Megan, what’s the matter? 6. You have to be patient. 7. Evan, you’re not listening. 9. Awe sweetie, you’re ok. I think we just need to start focusing more on the Fruits of the Spirt!! 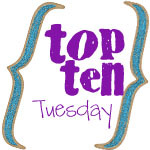 For more top ten lists or to make a list of your own, go here.